3 Fish Studios is the brain child of husband and wife team, Annie Gavin and Eric Rewitzer. Eric was born and raised on the industrial shores of Lake Michigan. He studied at the Cleveland Institute of Art, and moved to the west coast in 1987. Eric finds constant inspiration in the scale and diversity of the the California culture and landscape, and will forever love the mix of natural beauty, urban grit, and human diversity on display in San Francisco. Eric specializing in iconic linocuts. 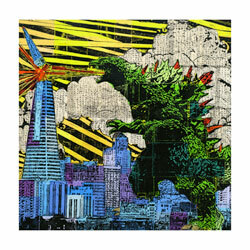 We carry several signed reproductions printed using archival quality inks and paper. Click on the thumbnails to see larger versions and to purchase framed or unframed prints online. 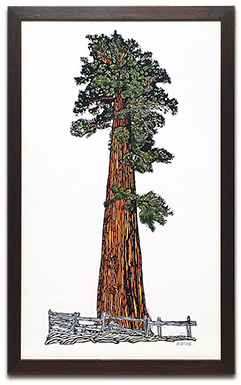 This towering Sequoia is Eric Rewitzer's newest natural giant, printed by hand on 300gsm Rives BFK paper. 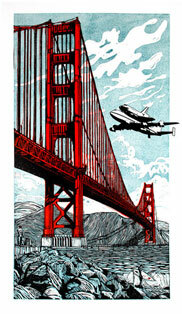 Each print is made by individually inking the plate, and running it through a 48" monotype press. 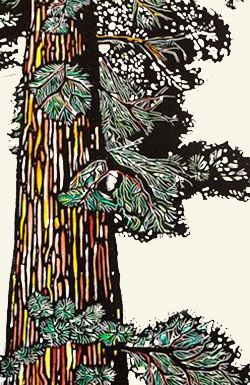 Once dry, the print is painted in watercolor by hand and signed by the artist. Framed in a dark rough wood frame and handwraped fabric mat. Click HERE to see a larger version and to purchase via PayPal. 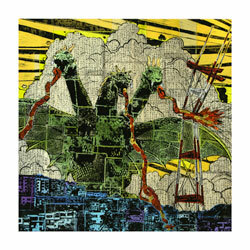 Eric Rewitzer has produced an outstanding icon for the spirit of California. Inspired by a moving statement issued by the California Legislature following the national election, Eric felt compelled to represent California rising up and stirring into action. The California Rising print (left) was featured in TIME Magazine the week of February 7, 2017. 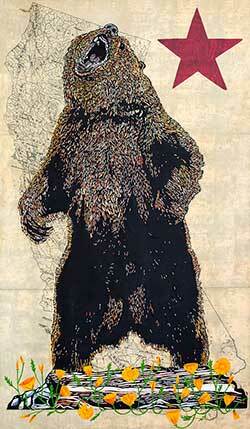 It depicts a roaring bear standing in a field of poppies, with an antique map of California in the background. 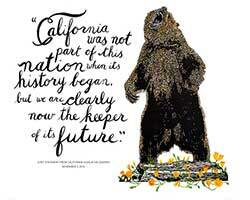 The Califorina Keeper poster (right) is a marriage of words of the California legislature with Eric's California Rising linocut.